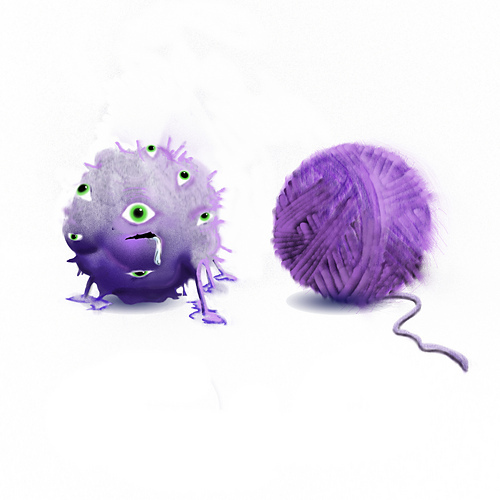 When Didi tasked me with designing a scarf for her Shoggoth shipment of The Yarn Club of Unspeakable Horror, she said to me “do whatever you want, just make sure it has a million eyes.” While slightly less creepy than one million real eyes staring back at you, One Million Eye(let)s scarf does not have exactly one million eye(let)s, but it’s pretty close. I really like this scarf. It’s a lot of fun. 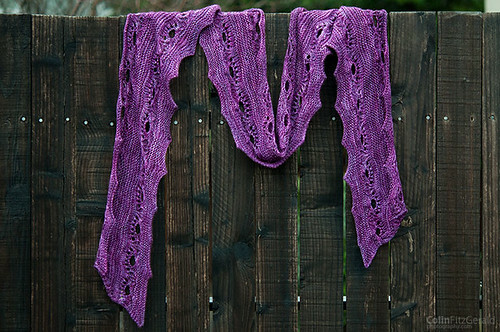 I’ve been considering making a worsted weight shawl version. 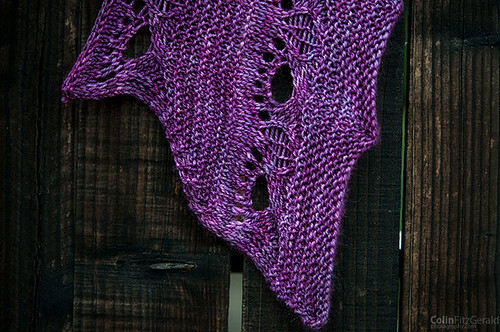 It’s incredibly simple to convert this pattern from a scarf to a shawl. 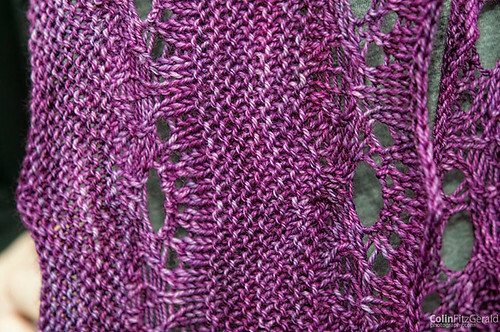 Once you have your gauge (or at least a rough estimation of your gauge), you cast on for the wingspan of the shawl. From there, work the pattern as written. Because decreases are built into the pattern, the gentle slope shapes itself into a wide triangle. It’s awesome because instead of ending on a point, you end with a flat edge, so you actually get a parallelogram instead of a triangle. Of course, you can work this to a triangle point, it just requires more decreases and extra rows. This scarf can be worn either blocked or unblocked. When blocked, the scarf becomes a long, delicate piece of open work lace (your scarf won’t block to point as shown unless you use pins instead of blocking wires). 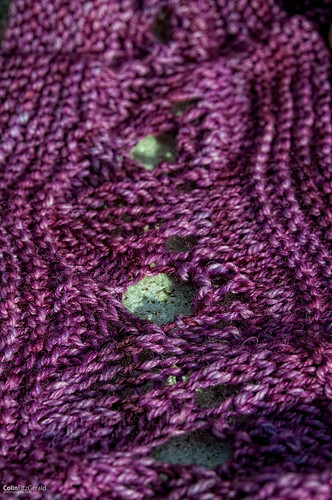 If left unblocked, the cables and groups of eyelets will allow a gentle ruffle to develop. 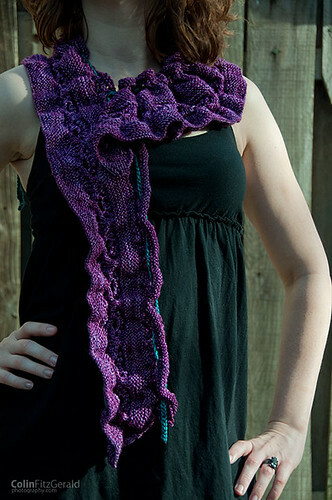 If worn unblocked, you may consider the use of an icord to cinch the scarf fashionably around your neck. The pattern is worked in alternating sets of garter stitch and eyelet lace. 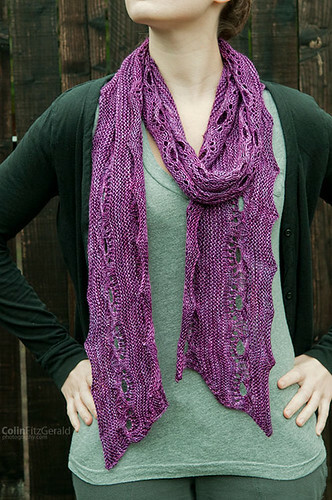 Each panel of garter stitch decreases 28 stitches and gives the scarf a tapered shape. If you would prefer to work the pattern in more of a shawl shape, the pattern includes a formula to cast on a smaller number of stitches. Shaping is built into the pattern.